Child-friendly?The new film Julie & Julia may be an attempt to bridge two different generations together: those who grew up watching Julia Child on television and those who currently use social media. The PG-13 rating comes with some strong language at times and some sexuality. The story also involves some "grown-up" themes such as feeling lost in life and wanting to have a good career. This makes the film probably appropriate for most teenagers aged 14 and up. Meryl Streep plays Julia Child in the new film that combines the celebrated cook with a blogger who chronicled her attempt at mastering the lessons of the chef. 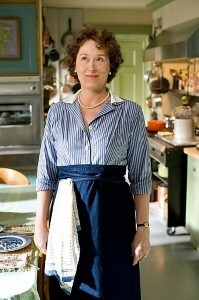 Julie & Julia is a comedy that is probably more suited for an older demographic, given its language at times and adult themes (about career, feeling lost in life and some sexuality). Julie Powell (Amy Adams) is tired of her job as a secretary and slightly jealous of her friends and their careers. In an effort to change her life, and to prove to herself she can do something substantial, she decides to spend a year cooking all 524 recipes in Julia Child’s Mastering the Art of French Cooking. Naturally, this leads to some kitchen mishaps and the occasional dropped entree on the floor. Powell blogs about her experience, which is where the film gets its name, and that experiment eventually led to her turning it into a memoir titled Julie and Julia: 365 Days, 524 Recipes, 1 Tiny Apartment Kitchen. However, there is a second element to the film that follows Child during her days in France in the 1940s and 1950s. It’s meant to mirror Powell’s experience at wanting to accomplish something in life, but also shows how the famous chef changed the landscape of American cooking. Teenagers who are active bloggers may respond well to this film, and may even be inspired to start an online project of their own.